Northern Lights will be at their very best because there is such little light pollution in the Arctic wilderness. 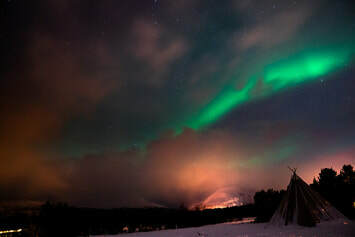 ​So join Diva Destinations on our hosted group tour to Lapland in search of the Northern Lights. Your Diva Destinations representative will meet you at the airport and look after the group for the 5 days, on this exciting arctic experience. You will be staying in a cosy, traditional arctic Hotel close to the village of Karesuando. From here you will enjoy panoramic views over the snow-covered hillside, deep in the heart of True Lapland. Rooms are simply furnished with en-suite facilities.